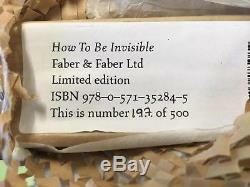 The Special Deluxe Edition of How to Be Invisible: Selected Lyrics is the ultimate volume for the Kate Bush listener. Signed by the author, numbered and presented in a solander box, this very limited edition fully reflects the beauty, humanity and complexity of Kate Bushs work. Accompanying the collection is an expansive introduction from Cloud Atlas author David Mitchell. Special Deluxe Edition - Signed by the author, boxed and individually numbered. LIMITED TO 500 COPIES WORLDWIDE. This is number 197 of 500. The book has not been opened and is still in the publishers' original packaging and box. For millions around the world Kate is way more than another singer-songwriter: she is a creator of musical companions that travel with you through life. For the first time ever, How to Be Invisible: Selected Lyrics draws together lyrics from Kate Bushs extraordinary 40-year career in music. Personally selected by the artist herself, the volume stands as a testimony to Kate Bushs globally-recognised talent. The edition arrives quarter bound with real book cloth spine and paper panels. Author and title on spine are blocked in gold foil, together with the title repeated in braille on the front panel. The books text is 90gsm Munken Premium Cream woodfree paper, and the book is completed by marbled endpapers, gold head & tail bands and gold ribbon. Also included is the exclusive letterpress print'Aerial Tal'. This arrives printed in gold on Canaletto Velino 300gsm paper, housed in a paper envelope. The item "KATE BUSH HOW TO BE INVISIBLE DELUXE EDITION SIGNED NUMBERED BOXED BOOK NEW" is in sale since Tuesday, December 11, 2018. This item is in the category "Books, Comics & Magazines\Non-Fiction\The Arts". The seller is "zoheir" and is located in Harrow. This item can be shipped to United Kingdom, Austria, Belgium, Bulgaria, Croatia, Cyprus, Czech republic, Denmark, Estonia, Finland, France, Germany, Greece, Hungary, Ireland, Italy, Latvia, Lithuania, Luxembourg, Malta, Netherlands, Poland, Portugal, Romania, Slovakia, Slovenia, Spain, Sweden, Australia, United States, Canada, Brazil, Japan, New Zealand, China, Israel, Hong Kong, Norway, Indonesia, Malaysia, Mexico, Singapore, South Korea, Switzerland, Taiwan, Thailand, Bangladesh, Bermuda, Bolivia, Barbados, Brunei darussalam, Cayman islands, Ecuador, Egypt, Guernsey, Gibraltar, Guadeloupe, French guiana, Iceland, Jersey, Jordan, Cambodia, Liechtenstein, Sri lanka, Macao, Monaco, Maldives, Martinique, Nicaragua, Oman, Pakistan, Peru, Paraguay, Reunion, Saudi arabia, South africa, United arab emirates, Ukraine.